Singer/songwriter Marie Dance is to mark the release of her debut album with an intimate performance in her home town. Marie said he album, entitled Things Have Changed, had taken two years to complete. It comprises original material and features a number of local musicians – some of whom will be making a guest appearance at the gig. It will be at the Duke of Wellington in Brighton Road, Shoreham, at 4pm on Tuesday. Marie will also be joined on stage by her band, The Purple Shoes, whose quirky, upbeat blend of folk and Americana music has won popularity with audiences across the south coast. 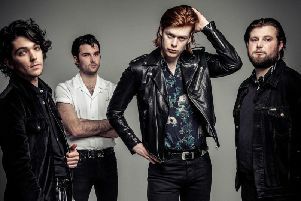 The performance will showcase a variety of songs, including tracks from the album and covers of songs groups including The Travelling Wilburys, Fleetwood Mac and Tom Petty and the Heartbreakers. Entry is free but people are advised to arrive in good time. Things Have Changed will be available to buy on CD at the Duke of Wellington show.